Cruising down the Cape Fear River on July 12, 2014, a friend of ours snapped a picture of Algemac II, Mog Canal Boat. Hillary and I had just departed Cape Fear Marina/Bennett Brothers Yachts in Wilmington, NC to rekindle the Great Loop pursuit. The idea here was to run about 100 miles of every system and see what improvements have been made with the upgrades just complete. Picture of the Algemac II passing by the USS North Carolina Battleship Park across from the Wilmington city water front. The last time we were out trying to put some Loop miles on, the boat displayed a number of shortcomings in applying the copious electric and fossil power to the water. Now, nearly eight months later and a decent investment in time, ingenuity, oh yes, and some of that greenback stuff, things are better. 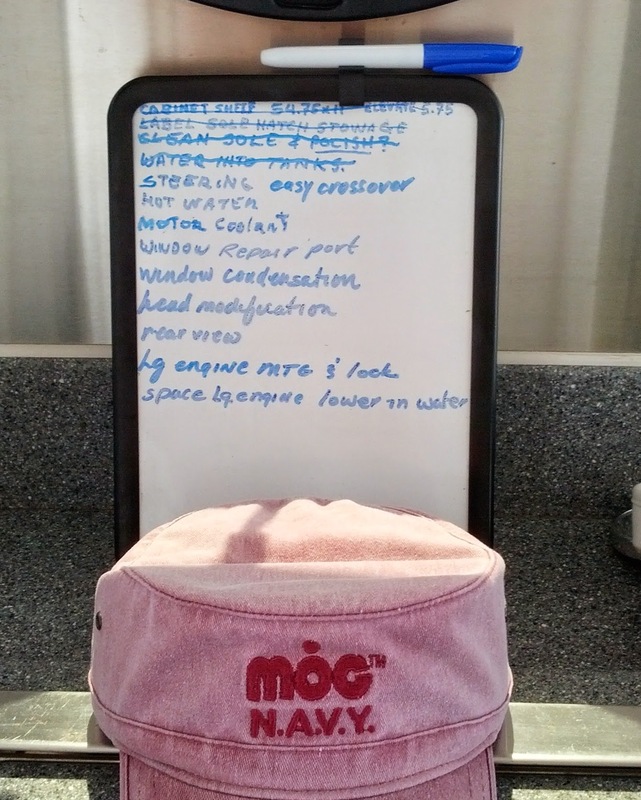 To sum up this latest adventure in technology, a nearly 100 mile sea trial put the steering system, propulsion coolant system, head and water system to an extreme test. Winds were fairly constant at nearly 12 to 25 miles per hour, with fairly decent gusts, swift tides, a number of swirling inlet crossings and beachings and anchor holding tests. The result of all this is that the boat is making good strides to be quite handleable for me and most moderately strong pilots. However, there needs to be less brawn and more finesse for Hillary. That is no slam at her. She is quite good at handling a 42 foot Grand Banks but this boat needs a steering system with a faster helm response than a 42 foot trawler AS WELL as a light touch on the tiller or steering wheel. Sounds simple but even the pros at Mercruiser/Volvo have their hands very full at reducing the number of turns (helm wheel lock to lock) from 3:1 or 4:1 to a staggering 1:1. And 1:1 is what I am doing. This is steering augmentation with a concurrent mechanical back up… no small feat. The reason for this is called 'extreme gunk holing'. Both differential (using twin motor steering) and rudder steering are used to negotiate very shallow water. The close proximity of a typical yacht’s rudders and propellers to a shallow bottom reduces maneuvering capabilities in many cases. Keeping consistent traction all the time can only be done by placing an actual full size hull in shallow water and beating the systems to death until you find the right combinations that culminate in a predictable system. 30 years exposure to computer aided solids modeling, hydrodynamic modeling and systems engineering, has taught me that models are plausible scenarios whose outcomes are predicted on the accuracy of the data upon which the models calculate. At some point the model must yield to empirical data……. where the wood meets the water. Therefore test, test, test then improve. Another vexing problem was that right up to the day of departure the propane stove and water heater worked flawlessly. Our first night out and the water heater would not work. The propane regulator of nearly twenty years has seen better days and gets replaced as of the writing. Luckily the weather was nice and the heat was plentiful to warm the roof mounted water heating for the showers. Yes, back up systems are wonderful. The propane stove/oven worked but is hardly used in hot weather. The microwave oven is so much more convenient for coffee and cooking than the oven and stove. Past the downtown area and the large drawbridge we slid by container ships unloading at the Wilmington Port and waved back to onlookers at the rail of the Henrietta III, a paddle wheel style tour boat of three decks and considerable length. All the way down toward the Snows Cut bridge the boat motored quietly and gently snugged a low tide sand bar. This was a good place to stop without dropping the anchor to have some lunch, read, listen to the radio while awaiting tidal liftoff from mother nature. An almost two hour respite was enough to get some catch up writing and reading done. I put the motors in reverse and off we went. Twenty minutes later the bridge was behind us and a few more minutes we were at Joyner’s Marina at the north end of Carolina Beach. We put just two gallons of petrol into the auxiliary engine’s tank for safety, dropped off our cans to the recycle bin, paid the attendant $8.41, then headed on for our overnight stay at Masonboro Island. At Joyner’s Marina for $8.41 of gasoline for the auxiliary engine. The day was warm with breezes so nice throughout the 24 mile jaunt to the island. Having arrived near 1600 just off the beach, I usually I hop off the aft deck and do some swimming. This time was to be different. With a two inch cut on the left leg I did not want to interfere with the healing. The salt water is just fine for the cut but may have prolonged the healing process. We have run the air conditioners at night many times with the large battery banks having plenty of power left for cruising next day. However, the winds were so strong, the windows were opened and a single fan directed the cool oceanside air through the cabins. The boat was anchored on the back side of a sand spit, barrier beach where the breeze of the ocean and the full moon Saturday night was beyond superb. This was the Masonboro Inlet at Wrightsville Beach, NC. There were a number of boaters during the day but by 2200 only one or two small cruisers were even left in sight. There is no doubt that using the power of the sun is really a strange feeling. There are no sails and the cost is part of the initial purchase of the boat ! ! ! A most difficult concept for most people to grab hold, is that once the boat is bought…. the fuel is free. The next morning was a bright Sunday sky mixed with billowing clouds. The clouds were well defined and were again blown by 12 to 15 mph winds. 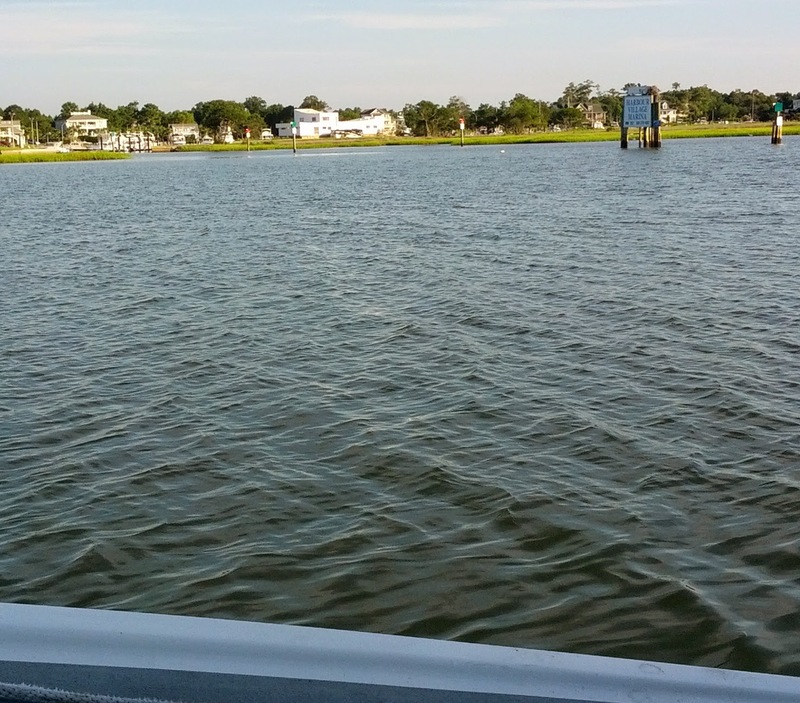 As we ventured across the Masonboro inlet where we had stayed, the tide formed behind the boat, yielded a nice kick up in speed to about 7 mph. The lowest speed we were to encounter was about 4 mph in strong head winds and tide. The motors were taxed with no let up in power. In fact, most times there was more electricity being replaced into the battery bank than being removed by the motors. Also, the two motors were being run from just one battery bank. Passing through Banks Channel at Wrightsville, the bascule bridge came to view and subsequently passed through by the low slung MOG. With an air draft (height above water) of only 8 feet 4 inches, the Algemac II went through the bridge opening while even smaller boats with flying bridges had to wait for the hourly opening. The view of the Wrightsville bascule bridge with the Blue Water restaurant to its left. A good place to have dinner and feed those diesels too. In the afternoon we arrived at the Harbour Village Marina where we own a slip of 40 feet. After getting into the slip some drinks were poured while contemplating where to dine, aboard the boat or in Surf City. It was unanimous, eating out would be good. Within just a few miles by car we found a number of places. Most were filling up with the dinner crowd. The decision was made to eat at Crabby Mikes, a good decision indeed. A dinner of scallops and fried shrimp was shared along with hush puppies and cole slaw. There was plenty left to take back to the refrigerator on the boat for seconds tomorrow. That evening in the marina, the shades went down, windows opened, fan on and the enjoyment of the evening breezes wafted through. The marina is very clean, modern and well laid out. The next morning the Algemac II moved deliberately out of her slip just as the sun was coming up. The winds were rising even higher today and the need to clear the little harbor was evident soon after passing out the entrance and into the ICW again. No sooner out than the winds began to steadily rise. Harbour Village is a lovely and well maintained marina. After our exit from the marina, the anchor was set and both of us had our breakfasts while watching for the tide change. This was a good deal because this time the tide would squarely be with us for a while. With all systems working, the electric motors were again engaged with the idea in mind of testing their heat capacity with the one gallon water-cooling reservoirs. For the next four hours the motors were driven at 2/3 throttle, well above cruise as evidenced by speeds of 8.2 mph while also filling the batteries between passing clouds. At about the end of the fourth hour the motors had heated the water very hot and the internal motor temperature sensors were beginning to take over, thus limiting their power output. The batteries were fine as were the motors and our speed returned to a more leisurely pace. The disposable plastic buckets will now be replaced by a custom 3 gallon stainless steel tank for each motor. The test was on an over 90 degree day for maximum heat stress. The new metal tanks should be more than enough to keep the motors well within specification without the need for additional fans and radiators. The Algemac II had been moving the fastest her slow displacement hull had ever moved. The hull was designed for 7 knots (8.05 mph) and had exceed her hull speed. Going faster simply uses more energy with an ever decreasing rise in speed. Therefore exceeding a designed hull speed is a waste of energy. However, from 8.05 mph on down, there is an increasingly efficient use of energy per mile covered. Somewhere between zero and 8 mph there is a sweet spot for handling and cruise time and that seems to be shaping up to around 4 mph. That may seem slow but works out to 20 to 40 miles traveled per day…… NO FUEL. Moving along at 8.2 mph, then slowing to a more leisurely 4.5 mph at the Figure Eight Island swing bridge. Before we knew it we were back at the Masonboro Inlet with the winds coming onto the bow at 25 mph, gusts and it started to rain. 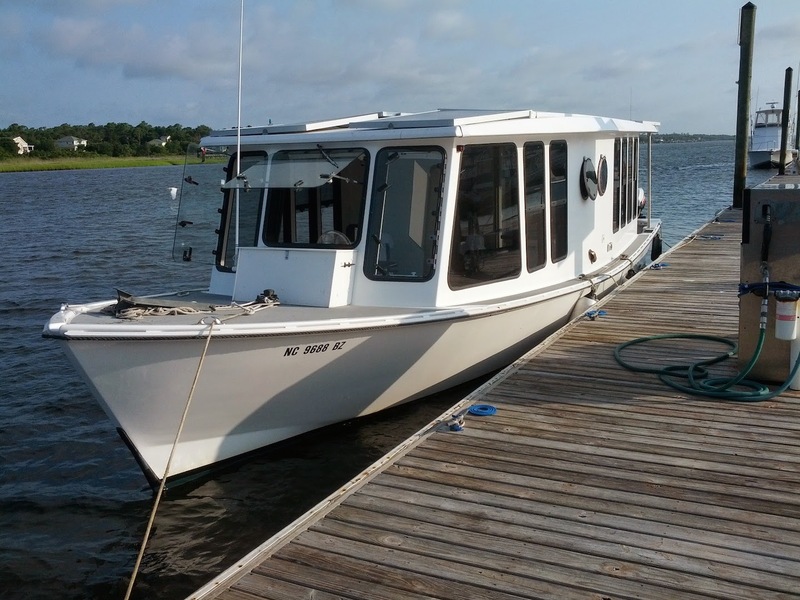 The boat was run up the cut at Masonboro Island and into a cove with about four small runabouts. The anchor was set, the winds rose more and the rains deluged the area….. we had just made it. The winds pulled hard and the anchor slipped nearly eighty feet, at which point it had dragged until we met the beach edge. the tide continued out for another hour then returned under our comfortably beached boat, once again floating us free. Collecting the anchor on the foredeck, the motors were throttled up and drove us over the sand bar at the entry of the cove and we proceeded to Joyner’s Marina. As the boat approached the marina the weather forecasting was being made unavoidably real. Dark storm clouds danced through the sky, buffeted by zig-zag winds that sheared the frothy tips off of wavelets. The marina landing would require a bit of speed with heavy reverse when side to the dock. To make things worse, someone had scraped a forty foot swath of rub rail off the doc’s edge exposing nail heads to puncture fenders and gouge boat’s sides. Kind of like landing on an aircraft carrier. Alas, the ship came in and all were safe aboard. With more wind and rain to come and reports of hail and damaging winds inland… I took Hillary’s advice to stay the night. 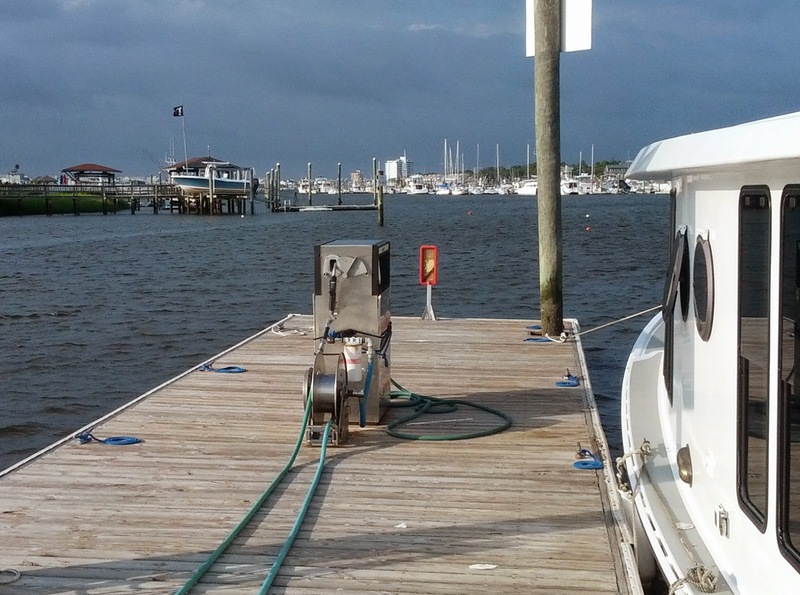 Extra fenders and lines secured us to the outside fuel dock so we could top the auxiliary engine tank on Tuesday morning before getting back to our home marina up the Cape Fear River. Flags blowing briskly in the rising winds before the storm sets in at Joyner’s on Snows Cut, northern Carolina Beach. Dinner was served aboard the boat as we talked about the days packed with memories of dolphins, a passing shark, some very nice folks on the ICW and windy but super sky power. After a couple showers ashore (had to get our money’s worth) we turned in for the night falling asleep to the waves lapping at the windward side of the hull. The morning brought breakfast and a cute dock attendant filled the auxiliary gas tank with less than 3 gallons for our homeward drive. The other boat that stayed at the other end of the dock loaded up at least 50 gallons of diesel at nearly $5 a gallon. We carry just two 3.5 gallon fuel tanks. No need to carry more right now. 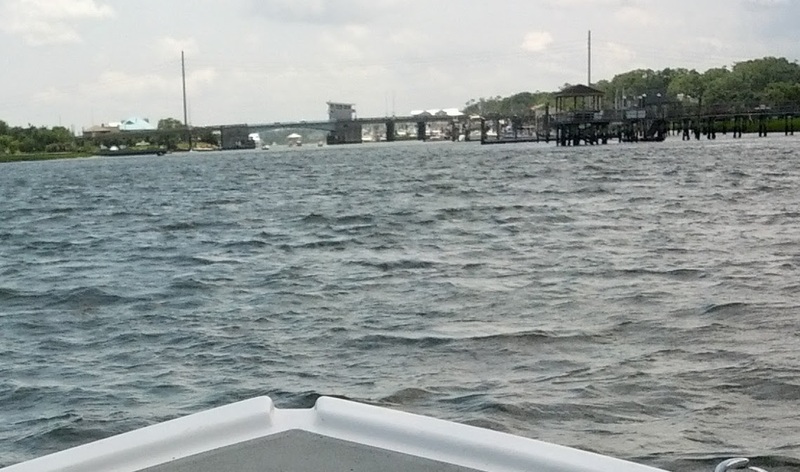 An uneventful yet bucolic sojourn up the Cape Fear river and past the drawbridge towers of Wilmington made this a picture perfect sea trial. A really happy note was that the auxiliary engine at about 2/3 throttle, was yielding a GPS speed of 9.2 mph approaching Wilmington, NC. A bit of a waste of energy, it clearly indicates that the unit is oversized for our efficient hull and I might be better served using a twenty-five hp engine. 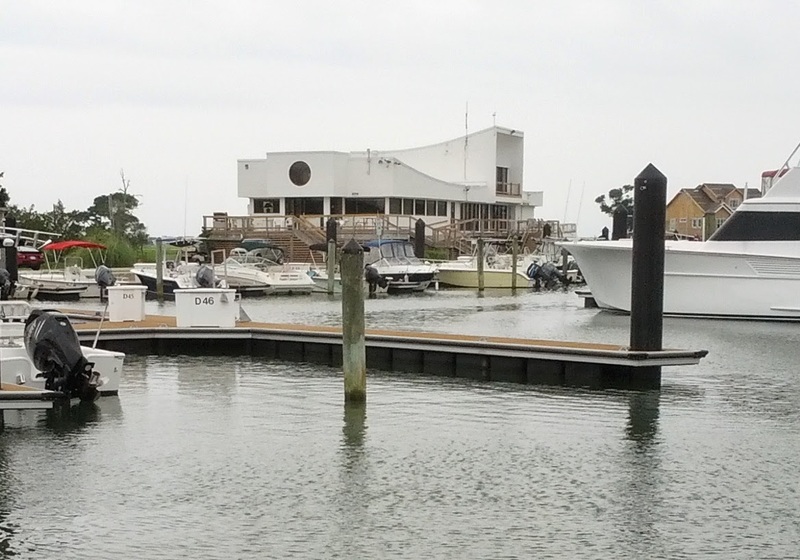 Pulling into Cape Fear Marina/Bennett Bros. Yachts at about noonish we tied to dock completed the new to-do list and returned to the condo downtown. As usual, there is more to be done, mainly an improvement on the steering to make it easier to turn the motors (when not using the remote control feature). We are too late in the season to continue up the east coast on the Great Loop but we can make more journeys and see the waters of the most beautiful ocean state on the east coast, North Carolina.